Get out and ride. The Pearl Izumi Elite Softshell Jacket is everything you'd want from a winter cycling jacket -- weather resistant, comfortable and warm. The Elite Softshell outer fabric is wind and water resistant, so the elements stay on the outside. It's also stretchy for unrestricted movement while riding. Elite Thermal Fleece panels have also been incorporated for additional insulation and efficient moisture transfer. The full-length zipper with internal draft flap and zipper garage puts ventilation or extra protection right at your fingertips. Additional touches include a contoured, shaped sleeve hem to provide a weatherproof seal against gloves, a single rear pocket, a single front zippered chest pocket, a comfortable tapered color, and 360 degree reflectivity. The Elite Softshell Jacket is available in various colors and features a semi-form fit. Streamline styling with a European fit. Great styling all around. The arm length is sized longer so you don't not have to deal with the cuffs working up your arms. The jacket fits snug with no loose materials flapping around while you ride. Overall a great looking jacket and very effective on keeping the elements out. Great Jacket for temps down to 45 F.
Morning winter cycling for temps down to 45 F. Size is accurate. I'm 5' 8 170, stocky build. M fits well and allows for a thick base. As a man who has a bit of a paunch, I feel the jacket fits well. It's not air tight or crushing but it is snug - just about right. It does well with the elements and I'd recommend it for a a 40 degree day. One of my favorite things about this jacket is the front pocket that has a small slit for head phones. There is also a zippered back pocket to keep your GU or whatever it is you want back there. I feel like it is a pretty well thought out design thus making this a jacket that you would actually use to go for a walk, a run. Hell, it's even stylish enough to wear at the bar. In my estimation, I'd say highly recommended. Keeps me warm on chilly days! Biking and running in sub 40 temps. I use this jacket everyday for a commuter ride. I never know what I might run in to for weather for the day so unless it is a down pour rain day I take this jacket. If it warms up no problem. It breathes excellent such that I don't over heat but on the other hand if it is a chilly morning when I get off Graveyards no problem. I wouldn't call it an all out rain wear though. If you get caught in it no problem you might feel some dampness coming through but if I know it is going to pour then I pull out the big guns. I needed a three-season jacket that was truly hi-vis . It's all of that and surprisingly comfortable as well, even for a very broad shouldered man. The jacket fits all my needs. It is warm and comfortable. One suggestion would be an additional side pocket. The sizing needs to be improved as I wear a medium in everything else but had to return my medium for a large. It is very comfortable and rain repellent. I also like the zippered to the neck feel. This is a great jacket, just what I was looking for to ride in the up and down temperature ranges of the Tidewater Area of Va.
With this jacket I now have the ability to ride on cold/damp weather days (38 to 50 degrees) that I didn't have before. It's not bulky and has great versatility. It's a quality jacket that I can add layers to for the colder temperature days. With this jacket I am able to put in more time on my bike outside. 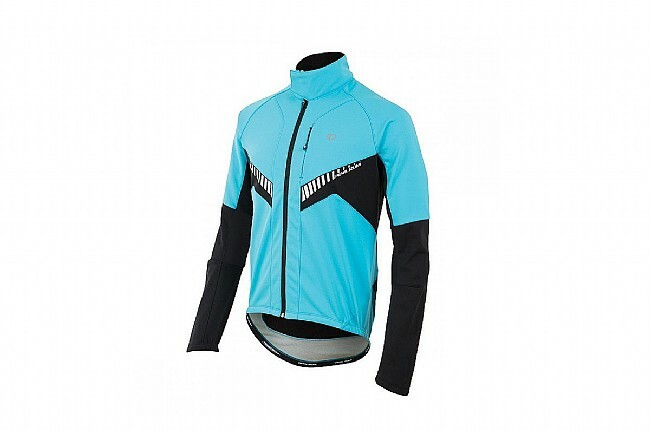 Great riding jacket, fits true to size described! I've used this jacket in 40-50 degrees with a base layer and it keeps me nice and warm even in windy conditions. The extra long sleeves are nice as they keep my wrists covered when my arms are extended over the drops. The back of the jacket keeps my bum covered and toasty, I highly recommend this jacket! Have used the jacket with light base layer in temps between 35 and 45 and the temperature control has been perfect. The sleeves are plenty long, which has been a problem with some other brands and the back pocket is just right for a cell phone and other small items. Great jacket, warm, not bulky, well tailored, and snug fit. This is fine jacket, great value, warm to mid 30s, snug fit. Rear and front pocket are good tight design. I wear a M or L in regular clothing, and,usually, a L or XL in bike gear. I ordered a L. It fits okay, definately not loose, and rather snug under the armpits. It is soft, with a fuzzy texture underneath, very similar to a Bell jersey that I have had for a while. Not waterproff, but it should be ok in a very light drizzle. There is not much room under jacket for layering, so I will be wearing a jersey or something small under. NO VENTS other than the front zipper. I can see how it will warm up and may get a little stuffy. Also, the front and rear are the same material. I generally like a little thicker, or wind blocking on the front, and a little thinner material on the back to let the heat dissipate. The yellow is very bright, but it has a lot of black on the rear where cars will approach. There are good reflectors. Would I buy it again? Probably not. I would spend a little more and get a nicer jacket. Great shell. This thing's an inferno. I bike commute throughout the winter in NYC. Usually we get a good stretch of 10-20 degree Fahrenheit mornings. This thing is light, tight, and extremely warm. 20 and windy this morning and I was nice and toasty on my ten mile ride to work. It has rubberized material on the inner sleeve cuffs and on the bottom garment hem so the shell doesn't ride up on you, or peel back and expose your wrists to the cold. If you value your cold weather rides, I highly recommend this shell. Note I usually get size M, but I wear an L in this. If you plan to use it as a layering piece, as I do, you may want to get a size up. The jacket is light, fits well and most importantly, is quite warm without overheating. Cuts the wind very effectively. This is not a Minnesota winter jacket - particularly in regard to the black inner sleeve material, which is not wind resistant. good to about 20 degreees F with layering, which the snug fit is not particularly conducive to. Nice curved long sleeves which are cut to cover glove cuffs, long tail with a gipper strip on the inside to prevent it from riding up. Very well cut and tailored. The jacket is comfortable for temperatures above 45 degrees and below 55 degrees. The jacket is not wind resistant and does not dissipate heat very well so it have limited use in south western PA winter rides. I do like the jacket however. Sleek and fitted jacket for a wide variety of weather conditions. This jacket has served as my outer layer on lots of muddy rides in the 40-55 degree fahrenheit range as well as some cold dry rides in the mid 20s. I've been impressed by how adaptable the jacket is. It's stretchy enough to stay form-fitting even if I've added additional layers, and it breathes well enough that I don't overheat even on long climbs. It's really been a great do-it-all garment. The sleeves are long and the back extends lower than a normal jacket, so this jacket does a great job preventing drafty conditions. 45-60 conditions you could wear this and a jersey and be set, but when it gets colder than that I find that it works well in a layering scheme. Typical great style and workmanship from P.I. Very good wind and water protection on the cold/wet days that are few and far between in Southern California. It's still a must have piece of apparel. I LOVE this jacket! I wear it as often off the bike as on. The only thing that could improve it is one or two slash pockets on the lower front.